Sydnee Cypress was nearly unstoppable in the batter’s box during a three-game stretch in March. 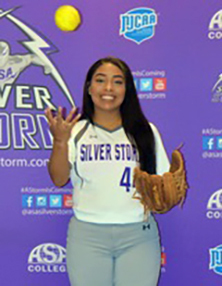 Cypress, a freshman for the ASA College Miami softball team, batted 7-for-11 with a home run, double and two RBI. The impressive stretch came in mid-March in a win against Rainy River Community College and a pair of losses against Pasco-Hernando State College. Through 16 games, Cypress, a former Moore Haven High School standout from Brighton, led the team in home runs with two. She upped her batting average to .373 with 19 hits, 4 doubles and 4 RBI.